I have both arms raised right now, actually. One is raised to signify that, yes, I'm guilty of buying games and then not playing them, and the other is raised so it can smack the back of my head for being so stupid. I'm also smacking myself because not only do I own games I've never played--hell, I've never opened a number of them--but I own a few games that I couldn't play even if I wanted to do so. Case in point: My copy of the Japan-only PS2 remake of Nights into Dreams. 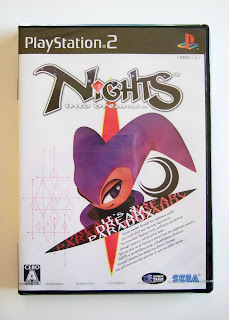 Now, before you jump onto my back--I intended to buy a Japanese PS2 system shortly after I bought Nights into Dreams (and a few other PS2 imports) but, well, it never happened. No worries; I'm sure I'll get around to it eventually. In the meantime, maybe I'll crack open a few of the other PS2 games I've yet to play--like Chulip or Romancing SaGa or We Love Katamari. You haven't opened We Love Katamari?! Are insane, man?! That game is amazing! Oh, I have no doubt it's amazing! I love the first Katamari, and I'm sure I'll the sequel -- I just haven't gotten around to playing it for some reason. Don't you own any games you've never opened/played? Nope. I'm a player. I own books I haven't read...TONS. But I love to read...Games, however...I couldn't NOT play them. They're too expensive for me to buy them in large enough quantities to NOT play them.